To bring our Uncanny community closer together, we’ll be featuring an Uncanny coach and a member each month. We want to help each of you learn a bit more about one another – strengths, weaknesses, favorite cheat meal, fitness goals, and everything in between. It’s also another chance to talk about what we love about CrossFit and what has led each of us to Uncanny Fitness. 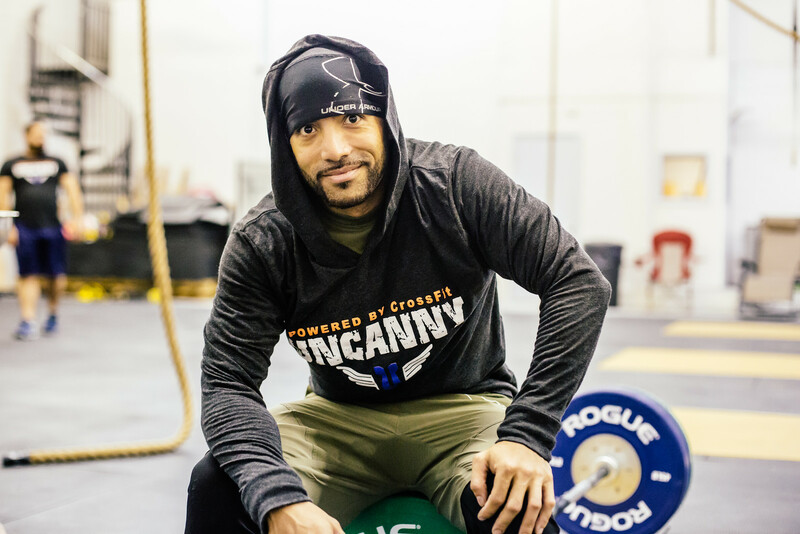 This month’s Coach Profile features Coach Chris or “MC” Chris. He is usually one of the first smiling faces you’ll see when you come into the gym and always brings positive energy to every workout he coaches. From going above and beyond to make sure that the gym and equipment are kept clean, to helping members reach their full fitness potential by moving properly, Chris is always looking for ways to improve our members’ experience. Uncanny wouldn’t be where it is today without Chris and we’re grateful for the work and care he puts into everything he does. Years of doing CrossFit: Five total years. Three years doing CrossFit and two years of coaching CrossFit. Occupation: Uncanny Operations Manager. I have also been MC-ing at CrossFit competitions around Florida and for bigger competitions such as the Granite Games in Minnesota and The Wodapalooza Fitness Festival in Miami, FL for the past four years. 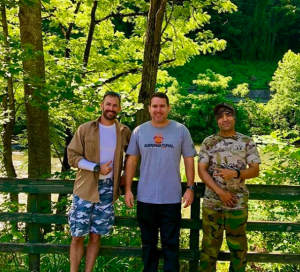 Uncanny members Joe and Rick with Coach Chris during their hike of the Appalachian Trail this June. Years at Uncanny: Since day one. I was doing personal training for people and talking smack about [CrossFit] on Facebook and Steve replied saying that I should come into the gym (CrossFit Tire Factory) and actually try a workout for myself because it’s not all the same. So, I came in to see what it was all about and did a class with Kuang—who, as everyone knows, is big on mobility—and he watched me do an American kettlebell swing and immediately stopped me to correct my form. Before that, I went to L.A. Fitness and didn’t know anything about mobility. He totally changed my perspective on CrossFit. Before CrossFit I used to hang out with negative people and seeing the community as so positive, even from the first two classes I took, I was shocked at the number of positive people so I decided to give it another week. There are so many successful, positive people who come to the gym to get away from their jobs, get a sweat on and hang out with other positive people. It really rubbed off on me. What expectations did you have when starting CrossFit? Have those expectations changed? I saw videos online of people throwing up doing crazy workouts like high volume deadlift workouts with rounded backs and it looked ridiculous. When I started CrossFit, I quickly found out that it wasn’t like that at all. CrossFit, I discovered, was something totally different from what I’d seen and experienced in the fitness industry. I found out that there were a lot of things that I thought I could do but I really couldn’t – like running. Running outside is not the same as running on a treadmill. I had no cardio when I started. But I did have double unders and pistols before I started. 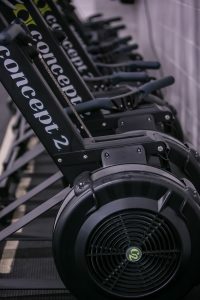 I was determined to go into CrossFit and not be the person who was mad all of the time because they couldn’t do something – like double unders and pistols. I watched videos from Graham Holmberg on YouTube and was able to get the movements in a few weeks. Coach Chris making sure Rick uses proper form while performing a hang clean. CrossFit isn’t always about competing like I originally thought it was. It’s more about fitness for longevity. I want people to be safe when they workout and workout with intention. Like helping people understand how best to attack a workout based on their own abilities. I want to help people take the steps they need to better themselves in the gym and in life. Even if it starts with just getting in early, doing their mobility or activation, whatever helps them get in their best frame of mind for the class so they can move properly. I don’t want people to be robots when they come in the gym and just go through the motions. There’s no growth from being a “yes” person. What made you decide to coach CrossFit? I wanted to have an impact on people’s lives. I wanted to be able to help people around me and help them to become a better version of themselves. I severed ties from the negative people in my life and decided that I wanted to help people who wanted to help themselves in fitness and in life. Name some things you enjoy most about coaching? Making an impact on people’s lives. Learning something different about humans every day. Not all of us are the same. You never know what someone is going through when they walk in the gym. So, I try to approach everyone differently because you don’t know what someone may be dealing with on any given day. What do you like most about Uncanny? We focus more on the mechanics here, like old school CrossFit. Some of our new members who have joined from other gyms noticed when they first started how well people move in the classes. Working on the mechanics of strength training is something we really like to emphasize. We also like to make sure things are super clean here for the members. I’ve visited a lot of other gyms and I know that not every gym is perfect, neither are we. But, Uncanny has a great space and we take pride in keeping it that way. I love hiking and am a survival enthusiast. My favorite trail is in Oviedo – Little Big Econ trail. I have a special campsite out there that I love to cook out on. When I’m not at the gym or hiking, I also enjoy reading – mainly books that deal with self-reflection. Favorite song/music to work out to? I don’t necessarily need music to keep me going in a workout. I try to focus on the workout as much as possible. I get motivated by working out with other people. What is your favorite Olympic lift and/or movement? 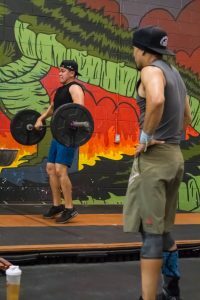 Favorite benchmark CrossFit workout? Diane is my favorite benchmark workout. But, Glen is my favorite workout. The way its programmed makes me not hate running as much as I usually do. Whenever I see it programmed I want to do it. Murph is probably my least favorite workout. GHD’s are probably my least favorite movement. I don’t see their functional purpose…unless I was hanging backward off a cliff and needed to use my quads to pull myself up. Ice cream. Talenti’s chocolate peanut butter cup. Team Talenti’s represent! I had a pretty troubled past that most people don’t know about. I used to hang out with people who weren’t a good influence on me and not a lot of good situations came out of those earlier years in my life. But, the bad things that I went through in my past happened for a reason. I’ve realized that we all have a different path that makes us who we are and if I didn’t go through some of the bad things that happened in my past then it wouldn’t have led me here. Book: “Ego is the Enemy” by Ryan Holiday. If you could work out with anyone, living or dead, who would it be and why? C.T. Fletcher because he is always “on” 24/7. He is the ultimate motivator. Go back to the Philippines – that is where my mom’s family is and I’d love to go back and visit.